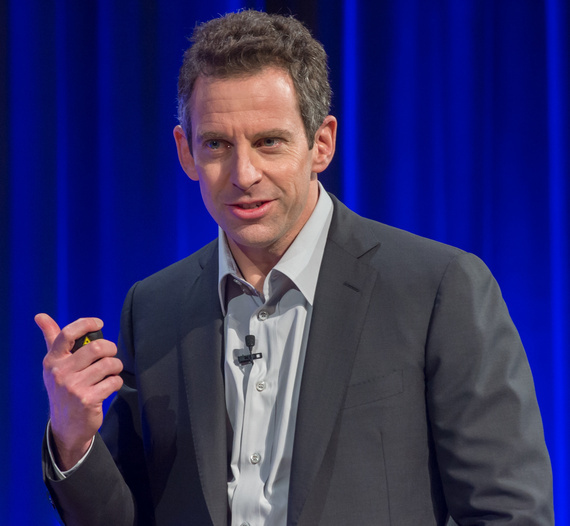 Noted atheist author and public intellectual Sam Harris has once again appointed himself a relevant arbiter on matters he is only tenuously familiar with. In a recent episode of his Waking Up podcast titled "Racism and Violence in America," Harris shared what he believed to be enlightened ideas on racism and declared that he wanted to gain greater clarity on issues unique to the Black community. Not wanting his lofty perspective contradicted, Harris avoided the likes of Stacey Patton, Michael Eric Dyson, Michelle Alexander, Kimberlé Crenshaw, Sikivu Hutchinson, or Marc Lamont Hill--Black academic-activists enmeshed in the struggle for racial justice in this nation. Instead, he opted to reinforce his beliefs by speaking with Glenn Loury, a professor of economics at Brown University. While Black America isn't a monolith, Loury--as a longtime Reagan conservative who now characterizes himself (9:47) as "centrist or mildly right of center democrat"--is in the vast minority. Although he's far from being a Stacey Dash, he was nevertheless carefully chosen for the same reason the media flocks to the small contingent of Black conservative token figures: to act as a Trojan horse that soothes white discomfort and diminishes white accountability when discussing race. Harris prefaced this deliberate act of smoke and mirrors by stating (4:09-4:18) he didn't want the discussion "contaminated by identity politics," explaining that he believes "identity politics are just poison, unless your identity at this point is Homo sapien." Identity politics are a form of political engagement that highlights issues and perspectives relevant to shared aspects of an identity. "Identity" is based on cultural context, social history, and lived experiences. Harris's assessment of identity politics is suspect for three reasons. First, it's impossible to ignore his appeal to "Homo sapien," which is a sly way of asserting "all lives matter" in the face of noticeable, disproportionate treatment of groups of people. How fortunate must one be to utter this without a hint of irony? Within the context of this discussion, his statement is akin to declaring "I don't see color. I just see people." Just like the idea of colorblindness is an act of racial avoidance, so too is the belief that "We're all just people." This sounds cool in theory, but we don't live in a utopia where every conceivable human identity across all economic, social, and political class barriers is unappraised. Until that day arrives, one can't ignore that some groups of people are less valued than others based on gradations of identity. This is made even more laughable when Harris later (18:49) admits that we don't yet live in a "colorblind utopia." Second, we're all familiar with the maxim, "Closed mouths don't get fed." Identity politics is a means of seeking and negotiating increased social power currently not being distributed in an equal or just manner. Examples of identity politics in action include feminism, LGBTQIA+ activism, and Indigenous resistance movements. The purpose of these causes is to address specific types of social ills that inconsistently impact the lives of misrepresented and marginalized groups of people. To describe this type of engagement as "poison" reflects a type of callousness and unconcern for the undesirable conditions being protested. Lastly, Harris's denigration of identity politics screams positionality bias, where any position or movement that deviates from widely accepted thought and practice are pejoratively labelled "identity politics." At the same time, dialogue, systems, and political engagement that favor the interests of cisgender, heterosexual white male mainstream narratives tend to be exempt from such uncharitable critique. We see the world through filters that are influenced by our social positions within society. Harris fully comprehends the implications of privilege, prejudice, and oppression when it relates to religious hegemony. He also fully perceives the social stigma and discrimination bound to the identity of being atheist in this country. But our social positions--identities--obscure our emotional and intellectual connection to other social realities, even when they allow us to recognize and appreciate certain social dynamics (i.e., privilege, prejudice, oppression, etc.) in close proximity to our lives. Harris's remarks on identity politics reveal the various ways he's socially and politically exempt from inequality, exposing his particular vantage point and level of awareness about the complex state of reality beyond the identities he possesses. For those who benefit from a certain social system, any considerable departure from homogenized beliefs and practices that serve their identity is met with bewilderment, contempt, and antagonism. When Harris and those of his ilk wax on about how they detest identity politics, what they're really saying is they disapprove of any attempt to decenter the mainstream narratives that serve them. That's just the first four minutes. Can you imagine the rest? "Who is the evil genius who first convinced the world that being able to honestly say that 'Some of my best friends are Black' is not an adequate defense against the charge of racism toward Black people?" "...What does Shakespeare say somewhere? 'Methinks he doth protest too much'? You know? The guy who says, 'Some of my best friends are...' protesteth too much. That guy is seeking an exemption from the moral judgement of others for having what he knows the others know to be unacceptable positions and he's declaring some kind of fig leaf here." "Showing white bias on the IAT (Implicit Association Test) doesn't make you a racist. Racism is the endorsement of norms that support that bias. It's a person's understanding that he's biased and his further claim that he's happy to be that way, because he believes that society shouldn't correct for such biases, because they're good, because white people really are better than black people. He's someone who wants society to be unfair based on the color of a person's skin, because he thinks skin color is a good way to determine the moral worth of human beings." Harris only regards overt forms of racism as indication of "true" racism. This is why he demarcates racism in such a way (27:04-27:14) that categorizes racists as being "a tiny minority in our society at this point" and the remaining white population as "people of goodwill, and people of moral enlightenment." He continued to prop up this belief by alleging whites who voted for Obama (27:32) have "cancelled their personal racism" and by using terms (27:38; 30:40) like "real racist." Of course this kind of rhetoric is music to the ears of all those who firmly believe intent trumps the presence of attitudes and behaviors ingrained through exposure to our cultural environment. Harris treats the widespread nature of implicit racism as innocuous and demands we reserve the label of "racist" for card-carrying Klansmen, though many of them would also deny being racist. Because, somehow, the adverse influence of racism that effects employment, housing, education, legislation, racial profiling, and mass incarceration are rendered null and void because many who are complicit with or involved in these processes are well-meaning. And here I thought atheists didn't put stock in magical thinking. Harris's definition of racism places an underlying emphasis on intentions. However, when discussing racism or any form of oppression, it's important to remember it isn't about intent--it's about impact. This analysis is so typical that it follows a very predictable script already deconstructed by multicultural academic Robin DiAngelo in two essays titled "Why It's So Hard to Talk to White People About Racism" and "11 Ways White America Avoids Taking Responsibility for its Racism." In these articles DiAngelo, a white woman, lucidly explains the flaws with Harris' porous assessment that insists, "If we are well-intended and do not consciously dislike people of color, we cannot be racist." DiAngelo shows why this kind of thinking is a convenient buffer for those who believe in the good/bad binary that affirms "racist/racism is bad." Since people believe themselves to be "good," assigning moral value to racism rather than identifying its existence as a fact of our reality leads to people searching for ways to disassociate from it altogether. This podcast episode is an excruciating testament to that fact. For a discussion meant to cover "racism, police violence, the Black Lives Matter movement, and related topics," Harris and Loury unsurprisingly devoted a considerable chunk of time retreading the "black-on-black crime" narrative. This is a non sequitur when it comes to discussing racism, police brutality, and racial justice. This tactic may come dressed in a veneer of concern, but it functions as a way to pathologize Black criminality and to victim-blame. The appeal to intraracial violence has been exposed time and time and time again as invalid. Not because it doesn't exist, but because crime tends to occur at a higher rate intraracially. Further, this argument assumes that Black folks either ignore or deny the existence of crime within their own communities, which even Black Lives Matter has described as "patently false." There are numerous Black-led organizing initiatives and protests that oppose intraracial crime within Black communities across the nation. But because the media typically chooses not to publicize these efforts, those who don't have a genuine interest in these matters won't research and will instead assume these efforts don't exist. This criticism, which is also commonly used to malign racial justice movements like Black Lives Matter, completely evades a key reason for stressing that Black lives matter. The condemnation of police brutality is only part of it. Racial justice advocates aren't saying ignore intraracial crime--they're demanding justice. The beef is with "selective enforcement," which includes racial profiling and scant judicial accountability when it comes to law enforcement brutalizing and murdering non-white citizens. Responding to a call for government agents or agencies to be held liable for malfeasance and gratuitous lethal force with "But can we talk about black-on-black crime?" is a willful attempt to refocus the discussion away from critiquing culture and social systems marred by racism. People outraged that people like Tanisha Anderson, Eric Garner, Alton Sterling, Natasha McKenna, and Eric Harris were murdered aren't saying all the victims were "blameless." They're saying not responding to police in an ideal, respectable manner doesn't warrant an extrajudicial death penalty. They're placing emphasis on their lives having value. They're justifiably upset because of cases like the white woman (suspected car thief) in Los Angeles who led police on a wild chase, stopped, got out of vehicle blasting music, ignored the cops, fumbled about and danced to the music, got back into the car and chilled, was apprehended alive, and able to have her day in court. They're justifiably upset because mass murderers like Jared Loughner, James Holmes, and Dylann Roof were all apprehended without incident and able to have their day in court. They're justifiably upset because white biker gangs can have a deadly brawl and shootout and be detained without incident. They were afforded their day in court. Far too many times, professionally trained law enforcement have shown they have the capacity to not react with lethal force but continuously forgo this consideration when dealing with people of color. Harris seeks to invalidate these and like concerns of the marginalized experience by virtue of his conceit and elitist rationalism. He claims he "gets it" then proceeds to invent ways to inoculate himself (and most whites) from the means of racial oppression that infest the structural systems of our society. These systems don't operate autonomously--you preserve or contribute to the state of these systems even if unaware. But Harris being uncritical of these things doesn't make him a villain. As previously stated, Harris is able to ferret out various nuances of prejudice and oppression related to the scope of his own identities. He's written compelling pieces of literature based on this understanding, such as Letter to a Christian Nation and The End of Faith, two books that helped me during my deconversion process. It's possible to both appreciate and critique the work of an individual, as the case is here. The national discourse on racism is impoverished and perhaps Harris truly feels morally obligated to positively contribute to the conversation. But that's not what we got. Harris decided on a sparring partner that allowed him to mainly pontificate unchecked and devalue enduring systemic issues intrinsic to the state of Black America. "I worry that BLM, if it got all the attention that it wants, it could set race relations back in this country a generation." •	Pressured the federal government to amend their process of militarizing police departments. •	Motivated the FBI to improve efforts to track fatal police shootings. •	Amplified awareness about police violence against Black women through the #SayHerName campaign. •	Helped achieve wider recognition for issues the Black trans community face. •	Launched the Police Union Contract Project--an extension of Campaign Zero--to hold law enforcement accountable. •	Compels white America to confront longstanding traditions of anti-blackness that permeate the interpersonal and institutional spaces of this nation. I want to end this by pointing out the problem with Harris's insistence that people discuss the topic of race and racism calmly and collectedly. He equates a person's inability to communicate in an unaffected tone with being unreasonable. It's absurd to expect a warm bedside manner when it comes to discrimination that targets one's very existence. Not everyone has the social luxury of examining these intimate matters in a detached manner. That doesn't make them unreasonable, that makes them healthy human beings with the capacity to experience a full range of human emotions. Of course opposing a deluge of anti-black contempt will produce passion--the only people not passionate about fighting for freedom from misrepresentation and oppression are the oblivious, the deceased, or those unaffected by said social imbalances. As long as deprivations courtesy of racism and white supremacy continue to adversely impact the life circumstances of Black America, expect those in touch with this reality to confront injustice with all the rage, frustration, and anxiety to be expected from enduring life in a land where your very humanity is questioned, disregarded, and despised.